Morning Light release date was Friday, October 17, 2008. Fifteen young sailors...six months of intense training... one chance at the brass ring. This exciting true-life documentary tells the inspiring story of a group of intrepid and determined young men and women, on the cusp of adulthood, as they embark on life's first great adventure. 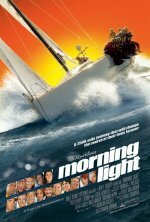 Racing a high-performance 52-foot sloop in the Transpac, the most revered of open-ocean sailing competitions, the crew of "Morning Light" matches wits and skills in a dramatic 2,300-mile showdown against top professionals. From their earliest training sessions in Hawaii conducted by world-class teachers through their test of endurance on the high seas, they form an unbreakable bond in the process of becoming singular team that is greater than the sum of its parts. Director Mark Monroe will wrap principal photography on the docu at the finale of the 2007 race in July. The project, which Buena Vista will release theatrically in 2008, is a particular success story for Hawaii, which released increased tax credits for filming on the popular destination.